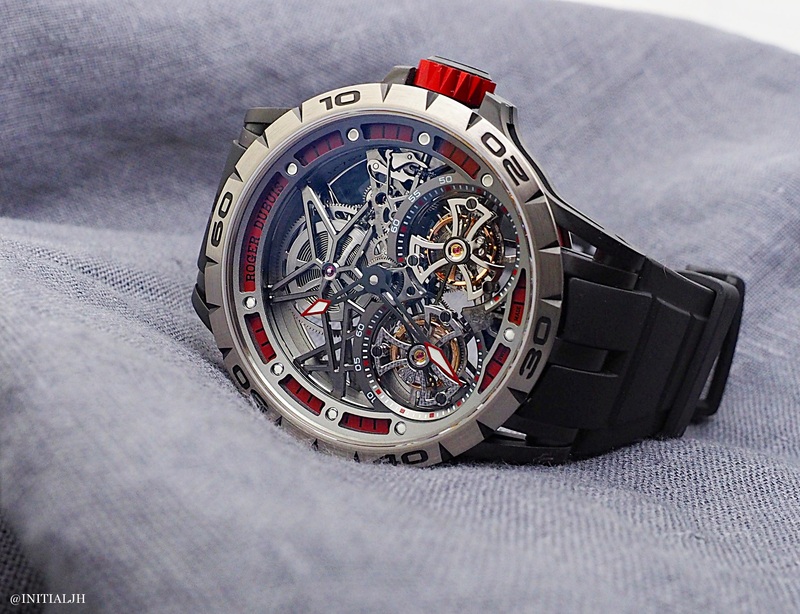 Last month at SIHH 2015 Roger Dubuis’ presentation introduced a number of skeletonised models featuring the Astral Skeleton movement with the distinctive Dubuis signature of a star in the movement architecture. Amongst the new models launched was the Excalibur Spider Double Flying Tourbillon. 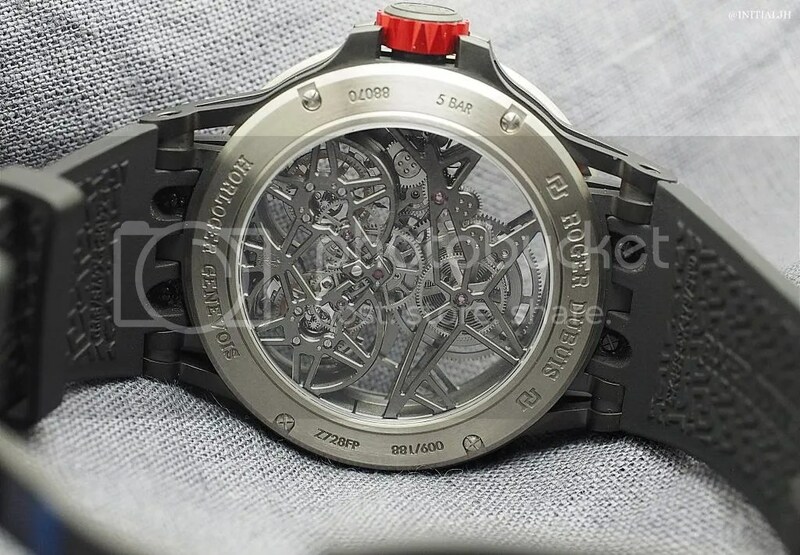 This 47mm sized watch is a reworked Excalibur case made of titanium and black DLC with a skeletonised flange, a middle made of five components, and a triple-lug design. The red features of the watch, including the crown, are aluminium, including ‘beneath’ the minute track. The movement is the RD01SQ (‘SQ’ for ‘squelette’, or ‘skeleton’), a revamped version of a movement first introduced in 2009 and now rhodium coated. This movement has 301 parts and a power reserve of 50 hours. However it’s not all about the skeletonisation, let’s not forget the name of the watch – there is a double flying tourbillon on the bottom half of the movement, which have a 60-second rotation. In keeping with the squelette theme, the hours and minutes hands are skeletonised with black DLC coating. Clearly, skeleton-upon-skeleton makes for difficulty for reading the time, so a decently sized red and white (lumed) arrow-head tip to the hands makes it (relatively) easy. 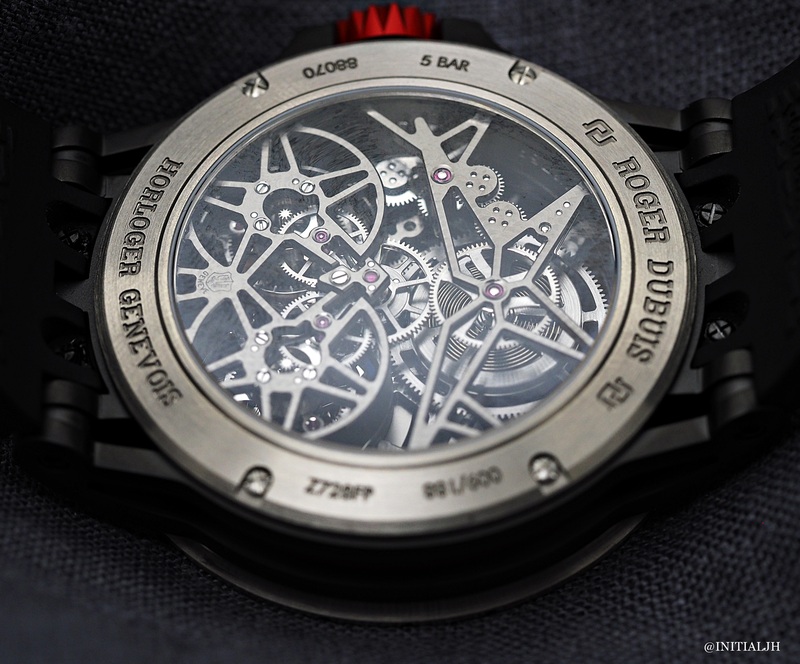 Roger Dubuis is an unconventional brand that like its fellow SIHH 2015 stablemate Richard Mille pretty much doesn’t care for broad audience applause. This watch appeals to those who are looking for something technically interesting and unapologetically modern but also slightly ‘out there’. To wear, despite the size at 47mm and 14.95mm thick, it is light because of the materials used, but also unexpectedly engaging, in no little part due to the whole ‘black/ red’ thing that can work well for sporty pieces. The Roger Dubuis Excalibur Spider Double Flying Tourbillon is fitted on a rubber strap with an adjustable titanium folding clasp. It will be produced in a run of 188 pieces and it is priced at 250,00 CHF. Oh and if you’re wondering about the ‘spider’ reference, it’s related to the star mentioned above – the five-point star barrel bridge represents a spider’s web.